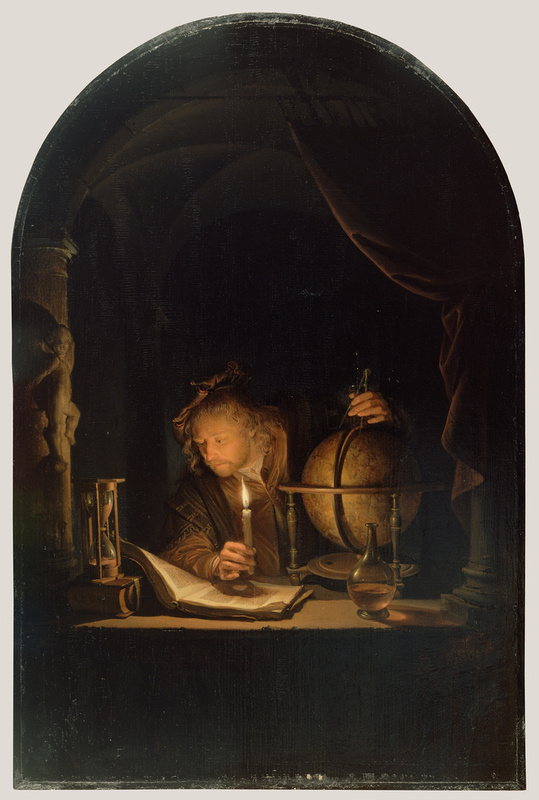 Strong contrasts between light and dark show the painter Gerrit Dou's knowledge of a popular Baroque technique known as chiaroscuro. Carefully rendering minute details such as the handwriting in the book, the texture of the glass flask, and the folds in the astronomer's cloak was Dou's special talent. Collectors treasured these small, detailed paintings for pleasurable observation in their private rooms. John Smith (London, England), sold to William Beckford, 1826. William Thomas Beckford, 1760 - 1844 (Fonthill Abbey, Wiltshire, England; Bath, Avon, England), by exchange with Abraham Hume, by 1829. John Jacob Astor, first baron Astor of Hever, 1886 - 1971 (Hever Castle, Edenbridge, Kent, England), by inheritance to Gavin Astor, 1971. Gerald Guterman (New York, New York), sold to the J. Paul Getty Museum, 1986. Hoet, Gerard. Catalogus of naamlyst van schilderyen met derzelver pryzen: Zedert een langen reeks van Jaaren zoo in Holland als op andere Plaatzen in het openbaar vekogt (The Hague: P.G. van Baalen, 1752), vol. 1, pp. 87, 411, nos. 2, 18. Lacoste, Rue de Richelieu, Paris. Catalogue d'une collection précieuse et du plus beau choix, de tableaux des trois écoles [...] composant le cabinet de M. L. April 14, 1817, pp. 12-13, lot. 19. Christie's, London. A Catalogue of a Small but Extremely Precious Cabinet of Exquisitely Finished Flemish and Dutch Pictures […]. May 6, 1826, p. 5, lot. 12. Smith, John. A Catalogue Raisonné of the Works of the Most Eminent Dutch, Flemish, and French Painters [...]. 9 vols. (London: Smith and Son, 1829-42), vol. 1 (1829), p. 33, no. 96. British Institution for the Promoting of Fine Arts in the United Kingdom, exh. cat. (London: William Nicol, 1839), p. 9, no. 30. Smith, John. Supplement to the Catalogue Raisonné of the Works of the Most Eminent Dutch, Flemish, and French Painters [...]. 9 vols. (London: Smith and Son, 1829-42), vol. 9 (1842), p. 6, no. 15. Christie's, London. Catalogue of the Highly Important Collection of Ancient and Modern Pictures Formed by William Delafield, Esq. [...]. April 30, 1870, p. 13, no. 79. Exhibition of the Works of the Old Masters, exh. cat. (London: Royal Academy of Arts, 1873), p. 9, no. 76. Christie's, London. Catalogue of the Collection of Old Masters of Albert Levy, Esq. April 6, 1876, p. 57, lot. 329. Exhibition of the Works of the Old Masters, exh. cat. (London: Royal Academy of Arts, 1888), p. 22, no. 84. Martin, Wilhelm. Het leven en de werken van Gerrit Dou beschouwd in verband met het schildersleven van zijn tijd (Leiden: S.C. van Doesburgh, 1901), pp. 190, 234, nos. 52, 314. Martin, Wilhelm. Gerard Dou. Clara Bell, trans. (London: George Bell and Sons, 1902), p. 111, no. 42. Hofstede de Groot, Cornelis. Beschreibendes und kritisches Verzeichnis der Werke der hervorragendsten holländischen Maler des XVII. Jahrhunderts. 10 vols. (Esslingen a. N.: Paul Neff Verlag, 1907-28), vol. 1 (1907), p. 362, no. 63c. Hofstede de Groot, Cornelis. A Catalogue Raisonné of the Works of the Most Eminent Dutch Painters of the Seventeenth Century, Based on the Works of John Smith. Edward G. Hawke, ed. and trans. (London: Macmillan and Co., 1908-27), vol. 1 (1908), pp. 364, 416-17, nos. 63c, 210. Martin, Wilhelm. Gérard Dou, sa vie et son oeuvre: Étude sur la peinture hollandaise et les marchands au dix-septième siècle. Louis Dimier, trans. (Paris: Jouve & Cie, 1911), p. 191, no. 172. Graves, Algernon. A Century of Loan Exhibitions, 1813-1912. 5 vols. (London: Algernon Graves, 1913-15), vol. 1 (1913), pp. 298-99. Art at Auction: The Year at Sotheby's, 1982-83; Two Hundred and Forty-Ninth Season (London: Sotheby Publications, 1983), p. 29, ill.
Sotheby's, London. Catalogue of Old Master Paintings. July 6, 1983, no. 80, ill.
Sutton, Peter C., ed. Masters of Seventeenth-Century Dutch Genre Painting, exh. cat. (Philadelphia: Philadelphia Museum of Art, 1984), pp. 187-88, no. 35, fig. 56. Sluijter, Eric J., et al, eds. Leidse Fijnschilders van Gerrit Dou tot Frans van Mieris de Jonge, 1630-1760, exh. cat. (Leiden: Stedelijk Museum De Lakenhal, 1988), p. 107n2, 107n7. Jeromack, Paul. "Double Dutch: Guterman Kisses His Babies Good-bye." Art & Auction (January 1988), p. 131. Baer, Ronni. "The Paintings of Gerrit Dou (1613-1675)." Ph.D. diss. (New York University, 1990), pp. 109.1-3, no. 109, ill.
Baer, Ronni. Gerrit Dou, 1613-1675: Master Painter in the Age of Rembrandt, exh. cat. Arthur K. Wheelock, ed. (Washington, D. C.: National Gallery of Art, 2000), pp. 36, 49n114, 49n115, 50n116, 126-27, 143n1-4, no. 31, ill.
Stafford, Barbara Maria, and Frances Terpak, eds. Devices of Wonder: From the World in a Box to Images on a Screen, exh. cat. (Los Angeles: Getty Research Institute, 2001), p. 372, no. 81. Chapel, Jeannie. "William Beckford: Collector of Old Master Paintings, Drawings, and Prints." In William Beckford, 1760-1844: An Eye for the Magnificent. Derek E. Ostergard, ed. (New Haven: Yale University Press, 2001), pp. 241-42, 248n116, figs. 13-10. Rembrandt-Bilder. Die historische Sammlung der Kasseler Gemäldegalerie, exh. cat. (Kassel: Staatliche Museen, with Hirmer Verlag, 2006), pp. 269-70, ill.
Bared, Robert. Le livre dans la peinture (Paris: Citadelles & Mazenod, 2015), pp. 78-79, fig. 56. Waiboer, Adriaan E. Vermeer and the Masters of Genre Painting: Inspiration and Rivalry, exh. cat. (Dublin: National Gallery of Ireland, with Yale University Press, 2017), p. 243, no. 18.12, ill.
Ducos, Blaise. “Reaching for the Stars.” In Vermeer and the Masters of Genre Painting: Inspiration and Rivalry, exh. cat. Adriaan E. Waiboer (Dublin: National Gallery of Ireland, with Yale University Press, 2017), pp. 208-9, 212-13, 290n4, fig. 98.